Here’s a complete tutorial on how to downgrade iOS 11.3 to iOS 11.2.6 on iPhone, iPad or iPod touch. Read through carefully before proceeding. iOS 11.3 is now out in the wild and anyone with a compatible device (iPhone 5s and up) can go ahead and install it. It’s packed with a lot of new stuff, including the brand new Battery Health feature that allows you to disable CPU throttling measures put in place by Apple if you have a deteriorating battery. In fact, iOS 11.3 improves on performance as well, something which might pique the interest of a lot of people out there. Obviously, everyone might not find the update in the same taste, and would prefer to stick with older firmware for a wide variety of reasons. Right now, Apple is signing iOS 11.2.6, and you can go ahead and downgrade to that software if you hurry up. Why? 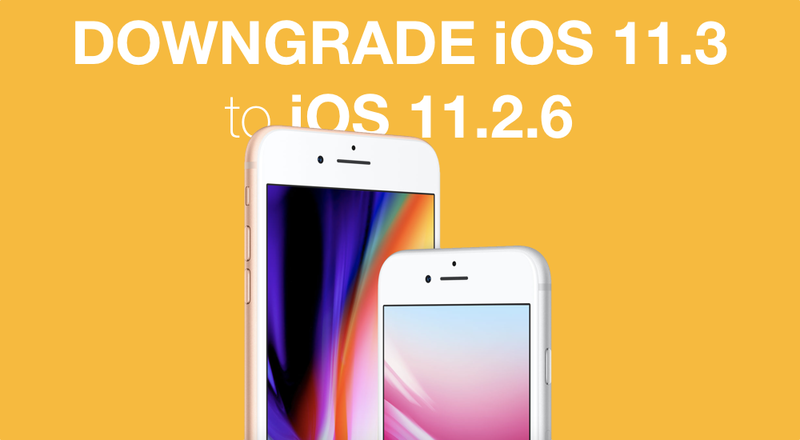 Because once Apple stops signing iOS 11.2.6, there’s no way you can downgrade iOS 11.3 to iOS 11.2.6. In today’s tutorial we’ll show you how to downgrade your iPhone, iPad and iPod touch right away. First and foremost, please backup your device as the downgrade process will erase everything. You can either use iCloud or iTunes to take a backup. It barely takes a few minute and is well worth it. Furthermore, make sure you download the iOS 11.2.6 firmware file for your iOS device and save it to your desktop. Lastly, download iTunes and install it on your computer (apple.com/itunes). Important note: This tutorial is not applicable to the newly released iPad 6. 1. Connect the iPhone, iPad or iPod which you wish to downgrade to your computer using a Lightning cable. 3. Wait for iTunes to refresh and you’ll see your device listed in the top left hand corner. 4. Click on the little ‘iPhone’ like button to view more options pertaining to your device. 5. In the center of iTunes you’ll see quite a lot of options related to your device, including backup. Hold down the left Option key (Mac) or the left Shift key (Windows) and click on the Restore iPhone button. 6. Select the iOS 11.2.6 firmware file you downloaded and saved to your desktop. 7. iTunes will now extract the contents of the firmware, restore your device and verify it with Apple. This step is going to take quite a while actually. Therefore take the time to prepare yourself a cup of coffee or something. Once done, you will see the Hello screen of iOS. Set up your device the way you want.